NHL News : Oilers planning drastic coaching change?! Oilers planning drastic coaching change?! 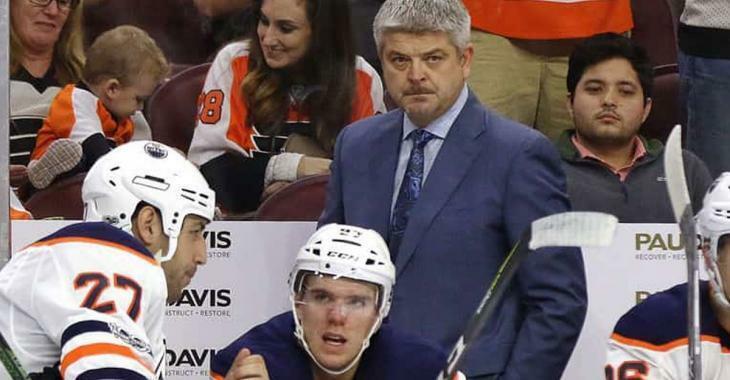 The heat is on Edmonton Oilers' head coach Todd McLellan nowadays as the Canadian team has recorded just one win in their last five games. While it is certainly not where management would like them to be right now, it seems like the front office could have a plan in mind to make drastic changes in Edmonton. According to NHL insider Darren Dreger, who explained the current situation at the moment in the Oilers' entourage, is that management is looking at it game by game, and that McLellan might still have his job now that the Oilers managed to win 6-2 over the Montreal Canadiens on Tuesday night. However, it could all change very quickly, especially seeing that Edmonton faces the Calgary Flames this weekend. "There has been some speculation, but he's safe for now and that was an enormous win over the Montreal Canadiens, 6-2 on Tuesday, so perhaps in some way that will alleviate some of the pressure. Now I know the big brass of the Edmonton Oilers met on Wednesday and that includes the likes of Bob Nicholson, Peter Chiarelli, Wayne Gretzky was there, Kevin Lowe part of it. Not unusual, but the message is let's stay the course so now they've got the Calgary Flames coming up on Saturday. The pressure may have cooled a little bit in Edmonton, but it's kind of game-by-game at this stage," explained on a segment of TSN Insider Trading. Management is surely keeping a close eye on this, and of course, it would be easy for the Oilers to look into calling up recently fired head coach Joel Quenneville, to see if he would be interested in leading the bench in Edmonton. Only hours after the firing in Chicago last week, The Hockey Central at Noon guys broke down teams in the NHL who they feel could seriously consider firing their coach now that Quenneville is available. The Oilers were not mentioned in their list. They believe the St. Louis Blues, Detroit Red Wings, Anaheim Ducks, Columbus Blue Jackets and Philadelphia Flyers, would be, or should be, interested.